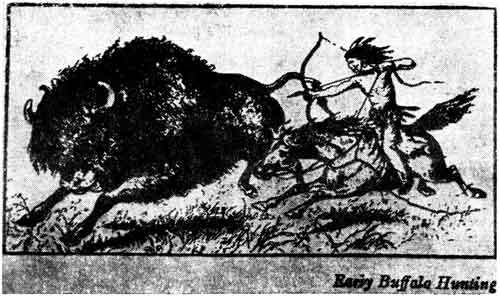 The Red River Buffalo hunt was unique in North America. In the story of the westward march of civilization across the continent no other people organized themselves so efficiently and so extensively for a systematic assault on the buffalo herds. These large organized hunts began in the early 1820s and continued until the early 1870s, though with gradually diminishing enthusiasm and extent as the herds dwindled and withdrew farther and farther westward. Probably no comparable community depended for so long a time and to such an extent on the "plains provisions" which the great hunts provided. This excerpt, taken from Red River Settlement is of the spring hunt of 1840. At this time the importance of the buffalo to the economy of Red River would be hard to exaggerate. Though this account is of particular events which the writer witnessed, everything that he tells us may be considered typical of most of the great hunts. ... "On the 15th of June, 1840, carts were seen to emerge from every nook and corner of the settlement bound for the plains ... From Fort Garry the cavalcade and camp-followers went crowding on to the public road, and thence, stretching from point to point, till the third day in the evening, when they reached Pembina, the great rendezvous on such occasions ... Here the roll was called, and general muster taken, when they numbered, on this occasion, 1,630 souls; and here the rules and regulations for the journey were finally settled. The officials for the trip were named and installed into office; and all without the aid of writing materials. The camp occupied as much ground as a modern city, and was formed in a circle; all the carts were placed side by side, the trains out-ward. These are trifles, yet they are important to our subject. Within this line of circumvallation, the tents were placed in double, treble rows, at one end; the animals at the other in front of the tents. This is in order in all dangerous places; but where no danger is apprehended, the animals are kept on the outside. Thus the carts formed a strong barrier, not only for securing the people and their animals within, but as a place of shelter against an attack of the enemy without. From this statement it is evident that the plain hunters are rapidly increasing ... The first step was to hold a council for the nomination of chiefs or officers, for conducting the expedition. Ten captains were named, the senior on this occasion being Jean Baptiste Wilkie, an English half-breed, brought up among the French; a man of good sound sense and long experience, and withal a fine bold-looking and discreet fellow; a second Nimrod in his way. Besides being captain, in common with the others, he was styled the great war chief or head of the camp; and on all public occasions he occupied the place of president. All articles of property found, without an owner, were carried to him, and he disposed of them by crier, who went around the camp every evening, were it only an awl. Each captain had ten soldiers under his orders; in much the same way that policemen are subject to the magistrate. Ten guides were likewise appointed; their duties were to guide the camp, each in his turn  that is day about  during the expedition. The camp flag belongs to the guide of the day; he is therefore standard-bearer in virtue of his office. The raising of the flag every morning is the signal for raising camp. Half an hour is the full time allowed to prepare for the march; but if any one is sick, or their animals have strayed, notice is sent to the guide, who halts till all is made right. From the time the flag is hoisted, however, till the hour of camping arrives, it is never taken down. The flag taken down is the signal for encamping. While it is up, the guide is chief of the expedition. Captains are subject to him, and the soldiers of the day are his messengers; he commands all. The moment the flag is lowered, his functions cease, and the captains' and soldiers' duties commence. They point out the order of the camp, and every cart, as it arrives, moves to its appointed place. This business usually occupies about the same time as raising camp in the morning; for everything moves with the regularity of clock-work. 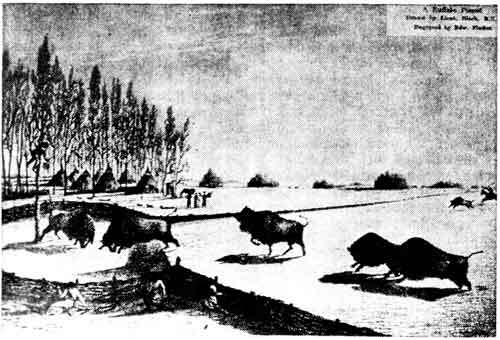 An artist's impression of a buffalo pound. For the second offence, the coat to be taken off the offender's back. and be cut up. Not to dwell on the ordinary routine of each day's journey, it was the ninth day from Pembina before we reached the Chienne river, distance only about 150 miles; and as yet we had not seen a single band of buffalo. On the third of July, our nineteenth day from the settlement, and at a distance of little more than 250 miles, we came in sight of our destined hunting ground; and on the day following, as if to celebrate the anniversary of American independence, we had our first buffalo race. Our array in the field must have been a grand and imposing one to those who have never seen the like before. No less than 400 huntsmen, all mounted and anxiously waiting for the word, "Start!" took up their position in a line at one end of the camp, while Captain Wilkie, with his spy-glass at his eye surveyed the buffalo, examined the ground, and issued his orders. At 8 o'clock the whole cavalcade broke ground, and made for the buffalo; first at a slow trot, then at a gallop, and lastly at full speed. Their advance was over a dead level, the plain having no hollow or shelter of any kind to conceal their approach. We need not answer any queries as to the feeling and anxiety of the camp on such an occasion. When the horsemen started, the cattle might have been a mile and a half ahead; but they had approached to within four or five hundred yards before the bulls curved their tails or pawed the ground. In a moment more the herd took flight, and horse and rider are presently seen bursting in among them; shots are heard, and all is smoke, dust, and hurry. The fattest are first singled out for slaughter; and in less time than we have occupied with the description, a thousand carcasses strew the plain. Those who have seen a squadron of horse dash into battle, may imagine the scene, which we have no skill to depict. The earth seemed to tremble when the horses started; but when the animals fled, it was like the shock of an earthquake. The air was darkened; the rapid firing at first, soon became more and more faint, and at last died away in the distance. Two hours, and all was over; but several hours more elapsed before the result was known, or the hunters reassembled; and who is he so devoid of feeling and curiosity; that could not listen to a detail of the perilous adventure. The moment the animals take to flight, the best runners dart for-ward in advance. At this moment a good horse is invaluable to his owner; for out of the four hundred on this occasion, not above fifty got the first chance of the fat cows. A good horse and experienced rider will select and kill from ten to twelve animals at one heat, while inferior horses are contented with two or three; but much depends on the nature of the ground. On this occasion, the surface was rocky and full of badger-holes. Twenty-three horses and riders were at one moment all sprawling on the ground, one horse, gored by a bull, was killed on the spot, two more disabled by the fall. One rider broke his shoulder-blade; another burst his gun, and lost three of his fingers by the accident and a third was struck on the knee by an exhausted ball. These accidents will not be thought over numerous, considering the result; for in the evening no less than 1,375 tongues were brought into camp. The rider of a good horse seldom fires till within three or four yards of his object, and never misses; and, what is admirable in point of training, the moment the shot is fired, his steed springs on one side to avoid stumbling over the animal; whereas an awkward and shy horse will not approach within ten or fifteen yards, consequently the rider has often to fire at random, and not infrequently misses; many of them, however, will fire at double that distance, and make sure of every shot. The mouth is always full of balls; they load and fire at the gallop, and but seldom drop a mark, although some do to designate the animal.